Designed in elegance and practical style, this Home Styles nightstand is makes a wonderful addition to any contemporary bedroom. Styled with a traditional look, this piece is sure to bring even more style in your home. This convenient nightstand will hold your books, your bedside lamp, your alarm clock, and more. 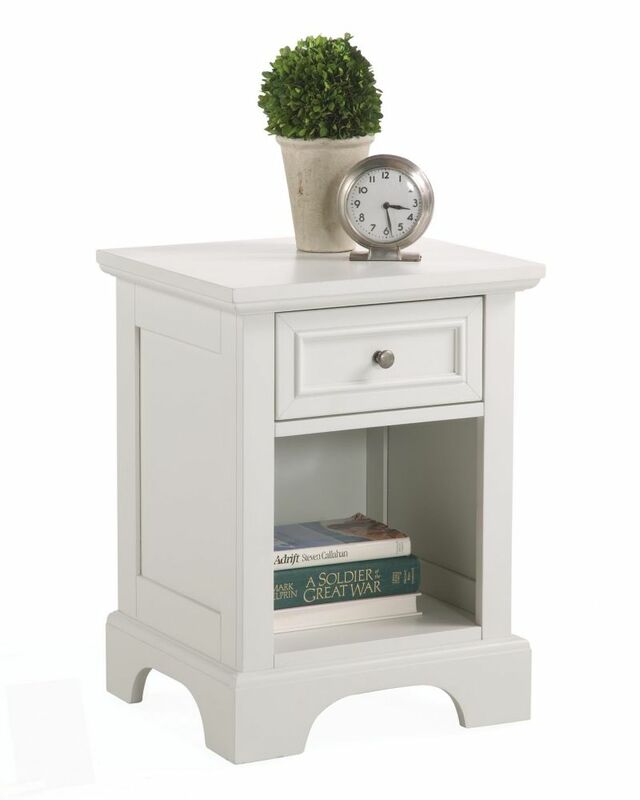 Let your home be more beautiful with the Taby Nightstand. The Taby Nightstand has unique eye catching design that will energize up you room. Set on splayed wooden legs with modern ring drawer holes, the Taby is both functional and beautiful. Includes 2 roomy drawers to store items and collectables. Use as end table in your living room, or a nightstand in your bedroom! Upon Assembly Measures: 21.06 in. Length, 27.36 in. Height, 13.78 in. Depth. Available in White and Yellow with wooden legs. Have all you need close at hand with the Astrid 2-Drawer Nightstand with Crystal Knobs. Profiled drawer fronts and acrylic crystal knobs add a beautifying touch. Use on its own or pair it with other matching pieces from the Astrid Collection. The two drawers discreetly tuck away everything you want out of sight, while the open shelf is perfect for stashing your favorite books, blankets or knickknacks. Constructed from non-toxic, laminated composite woods with a sturdy MDF backer. Manufactured in Canada and meets all North American safety standards. We all know that kids have a different way of organizing their space, depending on their personality and age. This nightstand gives you multiple configurations, so you can choose the one your little treasure needs. Get your youngster involved in deciding how to lay out the furniture so he or she will own the room and feel more at home! Naples 18-inch x 24-inch x 16-inch 1-Drawer Nightstand in White Designed in elegance and practical style, this Home Styles nightstand is makes a wonderful addition to any contemporary bedroom. Styled with a traditional look, this piece is sure to bring even more style in your home. This convenient nightstand will hold your books, your bedside lamp, your alarm clock, and more.